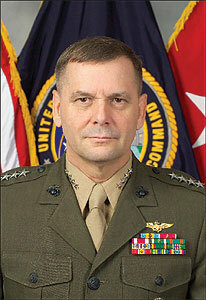 General James E. Cartwright is Commander, United States Strategic Command, Offutt Air Force Base, Neb. He is responsible for the global command and control of U.S. strategic forces to meet decisive national security objectives. USSTRATCOM provides a broad range of strategic capabilities and options for the president and secretary of defense. Command mission areas include full-spectrum global strike, space operations, computer network operations, Department of Defense information operations, strategic warning, integrated missile defense, and global C4ISR (Command, Control, Communications, Computers, Intelligence, Surveillance, and Reconnaissance), combating weapons of mass destruction, and specialized expertise to the joint warfighter. General Cartwright was commissioned a second lieutenant in the Marine Crops in November 1971. He attended Naval Flight Officer training and graduated in April 1973. He attended Naval Aviator training and graduated in January 1977. He has operational assignments as an NFO in the F-4, and as a pilot in the F-4, OA-4, and F/A-18. General Cartwright’s operational assignments include: Commanding General, First Marine Aircraft Wing (2000-2002), Deputy Commanding General Marine Forces Atlantic (1999-2000), Commander Marine Aircraft Group 31 (1994-1996), Commander Marine Fighter Attack Squadron 232 (1992), Fixed Wing Operations Marine Aircraft Group 24 (1991), Commander Marine Aviation Logistics Squadron 12 (1989-1990), Administration Officer and Officer-In-Charge Deployed Carrier Operations VMFAT-101 (1983-1985), Aircraft Maintenance Officer VMFA-235 (1979-1982), Line Division Officer VMFA-333 USS NIMITZ (1975-1977), Embarkation OIC VMFA-251 & 232 (1973-1975). General Cartwright’s staff assignments include: director for Force Structure, Resources and Assessment, J-8 the Joint Staff (2002-2004); Directorate for Force Structure, Resources and Assessment, J-8 the Joint Staff (1996-1999); Deputy Aviation Plans, Policy, and Budgets Headquarters, U.S. Marine Corps (1993-1994); assistant program manager for Engineering, F/A 18 Naval Air Systems Command (1986-1989). General Cartwright was named the Outstanding Carrier Aviator by the Association of Naval Aviation in 1983. He graduated with distinction from the Air Command and Staff College, Maxwell AFB 1986, and received his Master of Arts in National Security and Strategic Studies from the Naval War College, Newport, R.I., in 1991. He was selected for and completed a fellowship with Massachusetts Institute of Technology in 1994. General Cartwright was interviewed by MAT Editor Rodney L. Pringle. Q: What is the mission of USSTRATCOM, and what is your job as commander? A: U.S. Strategic Command’s combined missions focus on the primary goal of global deterrence. The threats we face range from non-state actors operating in the crevices between national boundaries, to rogue nations that seek to harm our nation, our deployed forces and our allies. To counter these threats and build a credible, strategic global deterrence, several new missions have been assigned to USSTRATCOM since 2002. The newest mission areas include Global Strike; Global Space Operations; Information Operations; Intelligence, Surveillance and Reconnaissance Integration and Prioritization; Integrated Missile Defense; and Combating Weapons of Mass Destruction. I work day to day with the brightest and most professional people who perform all aspects of this vast mission set as we continually strive to find innovative ways to make it easier for the warfighter to do his or her job. Q: What are your goals and objectives for USSTRATCOM? A: STRATCOM must continue to foster a culture of change and build a distributed, collaborative structure with the speed, precision and reach necessary to meet 21st century asymmetric threats and challenges faced by the United States of America. STRATCOM is a force enabler and provides a spectrum of both kinetic and non-kinetic options—from influence at the low end, to nuclear weapons—if ordered by the president of the United States—on the high end. We endeavor to integrate all elements of the spectrum and employ them with speed and precision. This requires continued investment in the development of command-and-control systems that can support rapid communications and data exchange with organizations and forces across the globe. Q: What has been USSTRATCOM’s traditional mission and how has that changed with the added responsibilities the command has taken on recently? Specifically, could you talk a little about USSTRATCOM’s additional missions for missile defense, space and global strike? A: The Command’s legacy missions include nuclear deterrence and military space operations. These missions remain a cornerstone of our national defense, and the need for them has not changed. The new mission areas acquired are also vital to our national security. To best posture the new mission areas, I restructured the command by establishing Joint Functional Component Commands [JFCCs] that align responsibilities and authorities, decentralize operational execution, and increase operational speed. These components align the mission areas with the experts who carry out the day-to-day functions of our operational missions. Leading Joint Functional Component Command for Integrated Missile Defense [JFCC-IMD] is the commander of Army Space and Missile Defense Command, dual-hatted as the commander, JFCC-IMD. The Missile Defense Agency has the specific assignment to develop missile defense systems, but it is the job of JFCC-IMD to bring a warfighter focus and make the system operational in order to protect the United States, our deployed forces and our friends and allies. Doing this requires JFCC-IMD to integrate and globally synchronize missile defense plans to provide an optimized, layered missile defense to meet strategic objectives. JFCC-Space is led by the same two-star who commands 14th Air Force at Vandenberg Air Force Base. This component integrates space capabilities of the various services and provides joint effects with Air Force satellites, Navy communications satellites and missile defense assets controlled by the Army. JFCC-Space cuts across boundaries to direct all elements of DoD space capabilities from daily space operations through space support to the regional combatant commands. The 3-star Air Force commander of 8th Air Force is also dual-hatted as the commander, JFCC-Global Strike and Integration (JFCC-GSI). JFCC-GSI integrates and synchronizes all elements of military power in support of USSTRATCOM’s global missions and when tasked, provides integrated global strike capabilities and delivers decisive joint global effects. JFCC-GSI is responsible for the Global Integration Center that leads the key integration effort across JFCC mission areas. Q: What are the primary challenges going forward in missile defense and global strike and what are some of the things that USSTRATCOM and the Department of Defense are doing to address these challenges? A: The continued integration of contingency plans and collaborative planning across geographic combatant commands, prioritization of joint global requirements for global ballistic missile defense assets and fostering continued development of functional command and control relationships beyond supported/supporting commands are issues that continue to challenge us as we move forward. Other challenges include continuing the work of increasing integration and support of global ballistic missile defense by linking across global ISR, global strike, information operations and space operations. These are steps that we continue to mature in support of the IMD mission. Challenges with global strike are continuing to develop and integrate the full spectrum of nuclear, conventional and non-kinetic options available to the president that will enable rapid achievement of effects against high-value targets in the context of strategic objectives. While we are confident in our ability to support effective global strike operations today, we must continue to evolve that capability to meet the Prompt Global Strike demands of an uncertain tomorrow. Q: What is “Prompt Global Strike” and what roles will it play going forward in national defense? How is “Prompt Global Strike” different from “Global Strike” and how is each important to the success of U.S. military forces going forward? A: The Prompt Global Strike (PGS) concept is intended to increase the range of options open to U.S. national leadership. The objective of PGS is to provide a credible strike within an hour as an alternative to nuclear weapons. It is also intended to create a deterrent for the U.S. and its allies, which is appropriate for the adversaries we face today. Global Strike is a vital piece of the new triad and provides robust offensive and defensive capabilities that adapt to adversaries who are more diverse in character ranging from transnational terrorist threats to dictatorships to nation-state threats. Q: What are some changes that the United States can implement to lead to less reliance on nuclear weapons and more on conventional weapons? A: STRATCOM is working on concepts of Global Strike and Prompt Global Strike that can leverage conventional kinetic weapons or non-kinetic effects on targets within hours instead of days or weeks. Some weapons can already support various missions. The Joint Direct Attack Munitions [JDAM] allows us to conduct day, night and all-weather operations. The Sea-launched cruise missile [Tactical Tomahawk] is more capable than the older version and provides better conventional capability to an SSGN. The Joint Attack Surface Standoff Missile [JASSM] is a new cruise missile launched from bombers and aircraft. The proposed Conventional Trident Modification, still in early phases of concept and development, would arm Trident missiles with non-nuclear warheads, providing speed, agility and a wider range of response options for our national leadership. Q: In previous speeches, you have talked about the need for “flattening command structures” and “building resilience into infrastructure.” Could you explain what both terms mean and why you think each are important to fielding a successful missile defense system? A: We must be committed to breaking down organizational and procedural barriers in order to integrate our efforts. I want to foster a culture of interdependence at STRATCOM as we continue to build a distributed, collaborative structure. Speed is essential for military decision making and operations today. Traditional, stove-piped, “Napoleonic” structures are not ideally suited in a world where waiting for perfect solutions will make those solutions irrelevant. That’s why I’ve worked to replace “need to know” with “need to share” in a network-based collaborative and horizontally integrated environment. Everything we do must be carried out in support of the warfighter—our most important customer. This approach applies across all our mission areas. Q: What are some of the strategic challenges to fielding a unified and cohesive missile defense system? What is USSTRATCOM doing to help overcome some of these challenges? A: Our command and control functions must be as responsive as possible. We must also continue to mature existing technologies while simultaneously developing newer tracking and interception platforms. Establishing the JFCC- IMD has been vital to integrating missile defense planning and operational support responsibilities, to include operational and tactical level plan development, force execution and day-to-day management of assigned and attached missile defense forces. As Single Integrating Authority for Missile Defense, we are developing an architecture that encompasses sensors, shooters, and C2 across ballistic and cruise missile defense. The needed capabilities are developed and coordinated with the other combatant commanders and service operational commands and presented to the acquisition community of Missile Defense Agency and the services. Q: What is the Conventional Trident Modification program? A: In December 2001, the Department of Defense completed a comprehensive review of America’s deterrence posture and published the Nuclear Posture Review. This study recognized that a deterrence strategy that relies primarily on nuclear weapons does not fully address the diverse set of threats we face today. The NPR articulated a new deterrence triad based on a comprehensive set of offensive and defense capabilities, supported by a robust infrastructure. The offensive leg of this new triad is comprised of U.S. legacy nuclear forces, a broader range of conventional strike capabilities, and non-kinetic capabilities. The NPR outlined a strategy whereby the number of our operationally deployed strategic nuclear warheads would be reduced while new non-nuclear capabilities are added to the deterrence portfolio. STRATCOM is leading the pursuit of the immediate development of a conventional ballistic strike capability to enable prompt delivery of conventional effects at global ranges in response to a variety of threats. The goal of the Conventional Trident Modification (CTM), the plan to arm Trident submarine missiles with conventional warheads, is to provide the president and senior leaders with a broader array of options for promptly engaging high-value targets at great range without crossing the nuclear threshold. CTM would provide America the ability to defeat a diverse set of threats on short notice. Q: What global deterrent capabilities has USSTRATCOM employed to better combat adversary weapons of mass destruction worldwide? A: After assuming several new missions in 2002, United States Strategic Command reorganized to foster better cooperation and cross-functional awareness. As these missions have matured, USSTRATCOM defined a need to transition from a centralized strategic planning focus to a more decentralized operational execution focus to assist the warfighter and react in a 24-hour, seven days a week world. The goal is to decrease the decision cycles for these operations and to increase efficiency and effectiveness of the support provided to the warfighter. A key initiative in this effort was the establishment of the USSTRATCOM Center for Combating Weapons of Mass Destruction to support the command as the lead for integrating and synchronizing DoD’s combating WMD efforts. The director, Defense Threat Reduction Agency leads this center for me and leverages all the capabilities he has at hand for this mission. Q: What can industry do to best help USSTRATCOM accomplish its mission? A: Industry is doing a great job supporting us at STRATCOM. We must reach beyond traditional military circles to employ nontraditional thinking and expertise to solve the tough problems of today. Through the newly opened Global Innovation and Strategy Center [GISC], USSTRATCOM is working to build partnerships between Department of Defense and the private sector—serving as a bridge between traditional and non-traditional sources of information. It will link together flexible networks of experts, tools, databases, relationships and other resources to produce integrated, broad-based solutions. Q: What else would you like to add concerning USSTRATCOM’s mission and your experiences thus far as USSTRATCOM Commander? A: USSTRATCOM’s missions are more diverse today than at any time in history. Throughout the past several years of tremendous change, the men and women of this command have done an outstanding job adapting and carrying out our missions in a new environment. We have eight mission areas now, and we have migrated from a legacy deterrence role to distributed operations across these varied mission areas. We continue to foster a culture shift toward an internet protocol-based, network-centric command and control architecture to foster communications with all our partner agencies in a distributive and collaborative environment. It has been an honor the past two years for me to command such a great organization of joint professionals, and I look forward to a continued flow of great and innovative ideas from our men and women who serve daily in support of our nation.